^ Schemm, P. (January, 2010). Egypt to soon announce King Tut DNA test results. Retrived on 2011-01-16. ^ Handwerk, Brian. King Tut Not Murdered Violently, CT Scans Show. National Geographic News. 2005-03-08: 2 [2013-10-21]. ^ King Tut Was Disabled, Malarial, and Inbred, DNA Shows. nationalgeographic.com. ^ 6.0 6.1 Bates, Claire. Unmasked: The real faces of the crippled King Tutankhamun (who walked with a cane) and his incestuous parents. Daily Mail (London). 2010-02-20. 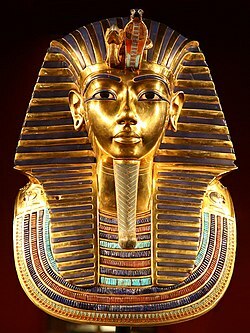 ^ King Tut's Family Secrets. National Geographic. September 2010 [2010-10-11]. ^ DNA experts disagree over Tutankhamun's ancestry. Archaeology News Network. 2011-01-22 [2011-02-24]. ^ Gwennedd, pseudonym. King Tut Revealed: Scientists do Virtual Autopsy of the Famous King and Find Shocking Surprises. DailyKos. 2014-10-21 [2014-10-21]. ^ Ledwith, Mario. The REAL face of King Tut: Pharaoh had girlish hips, a club foot and buck teeth according to 'virtual autopsy' that also revealed his parents were brother and sister. Daily Mail. 2014-10-19 [2014-10-21]. A 'virtual autopsy', composed of more than 2,000 computer scans, was carried out in tandem with a genetic analysis of Tutankhamun's family, which supports evidence that his parents were brother and sister. The scientists believe that this left him with physical impairments triggered by hormonal imbalances. And his family history could also have led to his premature death in his late teens. ^ Was King Tut Buried in a Hurry?. History.com. ^ Hawass, Zahi. 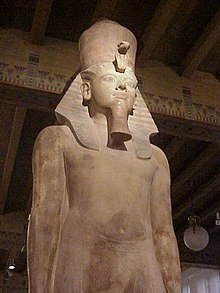 Tutankhamon, segreti di famiglia. National Geographic. [2013-06-02]. ^ Roberts, Michelle. 'Malaria' killed King Tutankhamun. BBC News. 2010-02-16 [2010-03-12]. ^ 16.0 16.1 Rosenbaum, Matthew. Mystery of King Tut's death solved?. ABC News. 2012-09-14 [2013-10-21]. ^ King Tut's Family Secrets. National Geographic. September 2010 [2013-10-21]. ^ Markel, H. King Tutankhamun, modern medical science, and the expanding boundaries of historical inquiry. JAMA. 2010-02-17, 303 (7): 667–668 [2013-10-21]. doi:10.1001/jama.2010.153. ^ Hawass, Zahi; 等. Ancestry and Pathology in King Tutankhamun's Family. The Journal of the American Medical Association. 2010-02-17, 303 (7): 638–647 [2013-10-21]. PMID 20159872. doi:10.1001/jama.2010.121. ^ Hussein, Kais; Matin, Ekatrina; Nerlich, Andreas G. Paleopathology of the juvenile Pharaoh Tutankhamun—90th anniversary of discovery. Virchows Archiv. 2013, 463 (3): 475–479. doi:10.1007/s00428-013-1441-1. ^ Owen, Jonathan. Solved: The mystery of King Tutankhamun's death. The Independent. 2013-11-03 [2013-11-03]. ^ Joseph, Claudia; Webb, Sam. Mummy-fried! Tutankhamun's body spontaneously combusted inside his coffin following botched embalming job after he died in speeding chariot accident. The Daily Mail. 2013-11-02 [2013-11-03]. ^ Joseph, Claudia; Webb, Sam. King Tutankhamun did not die in chariot crash, virtual autopsy reveals. The Independent. 2014-10-20 [2014-10-26]. ^ Joseph, Claudia; Webb, Sam. Tutankhamun died of illness, not from chariot racing. Russia Today. 2014-10-25 [2014-10-26]. ^ Redford, Donald B., PhD; McCauley, Marissa. How were the Egyptian pyramids built?. Research. The Pennsylvania State University. [2012-12-11]. ^ Comelli, Daniela; d'Orazio, Massimo; Folco, Luigi, et. al. The meteoritic origin of Tutankhamun's iron dagger blade. Meteoritics & Planetary Science (Wiley Online). 2016. Bibcode:2016M&PS..tmp..331C. doi:10.1111/maps.12664. "Early View (Online Version of Record published before inclusion in a printed issue)".